HÀ NỘI – The eighth National Congress of the Vietnam Buddhist Sangha (VBS) opened in Hà Nội yesterday with the participation of 1250 delegates including VBS dignitaries; monks and nuns; leaders and former leaders of the Party, State and Vietnam Fatherland Front and representatives of international organisations. Deputy Prime Minister Vương Đình Huệ and President of the Việt Nam Fatherland Front Huỳnh Thanh Mẫn also attended the event. 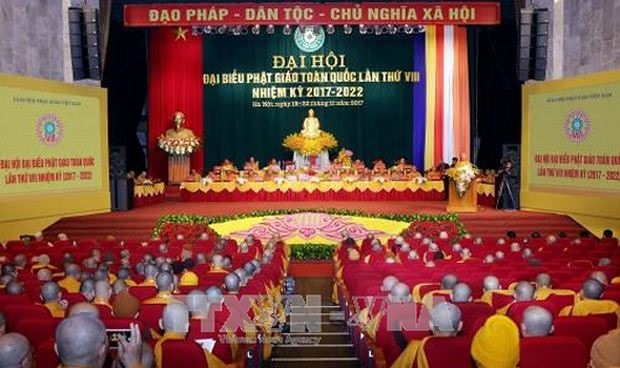 Addressing the opening ceremony, Most Venerable Thích Thiện Nhơn, chairman of the Sangha’s executive council, said the VBS, covering the 2017-2022 tenure, will review its activities for 2012-2017, discuss tasks for 2017-2022 and set forth amendments to VBS’ charter. Participants will discusses nine goals set by VBS for the tenure, including promoting the solidarity and development of the VBS through international integration, cultural exchange and people-to-people diplomacy, as well as intensifying the supervision of Buddhist activities in accordance with the VBS Charter and State legislation. They will also select members of the VBS Patronage Council and Executive Council for 2017-2022 tenure. Nhơn highlighted the achievements VBS had made over the past five years, noting that the Sangha established chapters in all 63 cities and provinces nationwide. The VBS successfully hosted the 2014 United Nations Day of Vesak. Pagodas were built on Trường Sa (Spratly) Archipelago and border areas as spiritual border markers safeguarding the nation’s territorial sovereignty, he said. The Association of Vietnamese Buddhists has established chapters in Japan, the Republic of Korea, Angola and Mozambique while those in Laos and Cambodia have been consolidated, according to the chairman. The Sangha has carried out many humanitarian activities, including organising classes for disadvantaged children and helping local residents escape poverty and overcome the consequences of natural disasters. The VBS has mobilised VNĐ6.3 billion (US$277 million) for social and charity work. Speaking at the event, Deputy PM Vương Đình Huệ said that with 2,000 years of tradition, the Buddhist Sangha had made great contributions to the development and protection of the nation. Buddhist followers had actively taken part in socio-economic development activities and assisted the elderly, children with disabilities and people living in difficult circumstances, he said. “Such charity work has strongly confirmed that VBC always respects the national patriotic tradition. The party and the State highly appreciate its role in the national resistance movement in the past as well as throughout the đổi mới (renewal) process,” Huệ said. He expressed his hope that the Sangha would remain an important link for overseas followers of Buddhism who want to continue developing the country.